You and your avatar can have many interesting experiences in virtual spaces. Below are tutorials and animations on working in virtual spaces; you will find that Badges are available too for many areas. There are different "viewers" that act as interaction-devices for your working in virtual spaces -- the one used in these instructions are for Imprudence; you will need to make some slight modifications if you are using Second Life or other viewers. Demonstrate your skill at navigating virtual environment. Here you will learn to move around the island in a number of ways. Click here for a 3 minute animated version of the directions below. After reviewing these directions and practicing on the virtual island, you can earn your own Virtual Badge: Navigator 1, by clicking here and passing the Challenge (see directions at the link) or by clicking the badge icon to the left. You can also fly by clicking Fly at the bottom of the screen. Use all the procedures here to move around and fly over the islands. Click Stop Flying or the letter F to resume walking. Move quickly by Teleporting -- click either Map or Mini Map at the bottom of the screen, then double-click the place on the map where you want to move. You can see dots for the other avatars too on these maps. On the Mini Map if you hover your mouse over the dot you will learn the name of the avatar too - you can double-click near the avatar to move to visit him or her. Being able to navigate and use a virtual space is improved once you can take pictures of any location within virtual spaces. Here you will learn how to use and save Snapshots. Click here for a 3.3 minute animated version of the directions that are also summarized below. 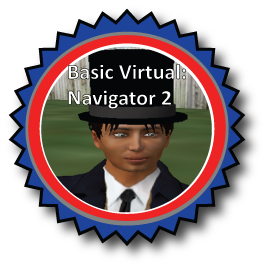 After reviewing these directions and practicing on the virtual island, you can earn your own Virtual Badge: Navigator 2, by clicking here and passing the Challenge (see directions at the link) or by clicking the badge icon to the left. The email option is not presently available. You can return and open your saved Snapshots from the Inventory and/or you can share the Snapshots that you saved on your computer. You can communicate with other avatars in a number of ways. Click here for a 3 minute animated version of the directions below. After reviewing these directions and practices on the virtual island, you can earn your own Virtual Badge: Communicator 1, by clicking here and passing the Challenge (see directions at the link) or by clicking the badge icon to the left. In the lower right of the screen, there are a number of talking/listening controls – by clicking Local Chat, you are given a textbox in which you can type a message & press enter and the message will be viewable to those nearby. It is good to work with another avatar to find out if they can hear you and to test your speaking abilities. [The animation & challenge are under construction; you can still practice from the directions below and from the animations & handouts provided below] You can build in reserved locations on virtual island known as, sandboxes. Click here for a 3 minute animated version of the directions below. After reviewing these directions and practices on the virtual island, you can earn your own Virtual Badge: Builder 1, by clicking here and passing the Challenge (see directions at the link) or by clicking the badge icon to the left. There are many steps to making good buildings, clothing, and materials. Be sure to come back to learn more, take more challenges, and earn more badges. In virtual worlds, the best teacher is experience – so practice building on your own; it is fun. You can create many objects, items, clothing, attachments, and jewlery that you can't do in the real world. Contact Dr. O'Connor either at eileen.oconnor@esc.edu for her work as an associate professor at Empire State College of the State University of New York or at eileen.oconnor1@gmail.com for the professional development materials.